After your clean the plastic windows on your Jeep’s soft top, you should immediately go through the simple process of protecting them. In effect, you’re locking in the window’s own natural oils and adding an extra barrier of protection from the sun’s harmful rays and other environmental effects (dust, dirt, pollen, etc.) that can impact the life of your soft top and windows. Designed exclusively for exterior vinyl to withstand repeated washings. Patented formula contains Ciba Tinuvin 5151 UV blockers. Will not harm auto finishes, glass, chrome or plastic. Can be used on both the soft top and the Jeep windows. It’s simple… just spray it on, let it set a few minutes, then wipe it dry. Can even be applied in direct sunlight. Since it doesn’t contain silicone, RaggTop protectant will not harm the paint, chrome, glass surfaces, rubber, vinyl or plastic windows of your vehicle. Truly repels water — even at the zippers and seams — which ultimately guards against small leaks and drips over time. Tested and endorsed by HAARTZ — the world’s leading supplier of convertible topping fabric for virtually every U.S. auto manufacturer, including Chrysler’s Jeep division and Bestop. The non-aerosol formula is also non-toxic. Environmentally friendly and biodegradable — contains no petroleum distillates, freon, or chlorofluorocarbons and is Ozone friendly. Provides a powerful UV screening treatment. Blocking UV rays prevents fading — it’s like 30 SPF sunscreen for your vinyl. Leaves a non-oily coating that safely treats vinyl, rubber, Hypalon, gelcoat, fiberglass, LEXAN, and sailcloth. Treated surfaces stay cleaner and repel dust, dirt, and water spotting. Contains no harmful silicone oils, petroleum distillates, waves, or abrasives. Leaves a beautiful like-new, non-oily, anti-static finish that repels dust and looks shiny. Surfaces stay cleaner longer, reducing long-term care and maintenance. Specifically formulated for Bestop soft tops, molded/soft accessories, and exterior/interior vinyl. Safely repels dust, grease, dirt and mildew. Provides complete protection against UV fading, cracking and hardening. Easy to apply… Spray it on, then wipe it dry. Contains no silicone or petroleum solvents. What About Furniture Polish Like Pledge? Yes, we’ve heard of using a furniture polish like Pledge on plastic and vinyl windows like those on a Jeep… However, we’ve also heard that it can yellow the vinyl over time or cause premature aging & cracking. In our opinion, Pledge is a great wax-based polish for products inside our house, but we don’t use Pledge (or other furniture polishes) on our Jeep windows. Furniture polish is designed for interior use and was never intended to be used outdoors, therefore it only adds a coat of wax which is of no benefit to the vinyl. Many other products used on cars are petroleum based. Petroleum and ammonia based products slowly eat away the surface of vinyl and rubber causing more problems than they solve. 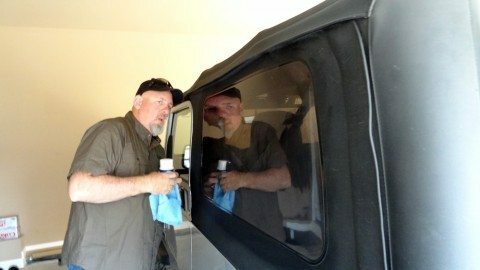 When it comes to the care and cleaning of vinyl or plastic windows, it’s no secret that Jeepers have learned some valuable tips from those in the marine industry. products like Windex, Pledge furniture polish, and other cleaning wipes — to name just a few. Products like Armor All are better for quick cleaning jobs on the inside, rather than longterm protection on the outside of your vehicle. Truth is, Armor All actually tends to attract dust and dirt. For that reason alone, you would never want to use it on your soft top or vinyl windows. That’s why we tend to save the Armor All for random quick touch-ups inside our Jeep (…plus, it’s great for getting your vehicle in tip-top shape prior to selling too). In sum, the immediate effects of Armor All are amazing… the long-term effects are less than ideal.